Ina Garten is my favorite Food Network chef. I could watch her all day, and her recipes without fail always appeal to my tastes. I've also been battling a serious cookbook addiction, and have been collecting new ones at an alarming rate. It's gotta be pathological. One of my most recent acquisitions was Ina's Barefoot Contessa: Back to Basics. This pan-roasted tomato recipe from the book called out to me as the perfect accompaniment to a variety of dishes, and also a great way to take advantage of our backyard cherry tomato bounty (along with our homegrown thyme and basil)! I served it this time with Lemony Pasta with Broccoli, Walnuts, and Toasted Breadcrumbs, but it would also be wonderful on top of grilled chicken or on the side with a panini or grilled cheese sandwich. 1. Heat the olive oil in a saute pan large enough to hold all the tomatoes in one layer. Add the garlic to the oil and cook over medium heat for 30 seconds. 2. Add the tomatoes, basil, parsley, thyme, salt, and pepper. Reduce the heat to low and cook for 5 to 7 minutes (Amy's note: mine took about 12 minutes), tossing occasionally, until the tomatoes begin to loose their firm round shape. 3. Sprinkle with a little fresh chopped basil and parsley and serve hot or at room temperature. I am so jealous!! 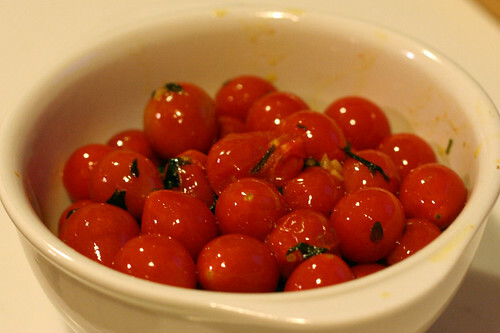 I want to have a have fresh cherry tomatoes and basil and thyme growing in my backyard! A bit difficult in NYC! I love that photo! I slow-roasted tomatoes yesterday... 4 hours in the oven! This would have been so much easier. Those tomatoes look amazing! I love Ina recipes and this one looks so fresh and easy. The cookbook is great so enjoy it! i too heart barefoot. don't apologize. she's great. yum.